ABOVE: An Alilaguna airport boat stops at the Zattere pier. The Zattere is a pedestrian promenade that runs along the Dorsoduro side of the Giudecca Canal, which is the main channel for cruise ships that are going to or from the Venice cruise terminals. 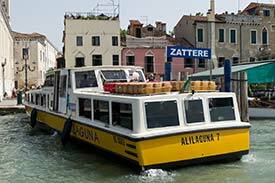 Midway along the canal are stops labeled "Zattere" for ACTV, Venice's public waterbus network, and Alilaguna (which operates airport boats between Marco Polo Airport and various points in the city center). You're coming from (or going to) Venice Marco Polo Airport. This renovated historic building on the Zattere is only a short walk from the San Basilio cruise terminal (which is used by river vessels, small- to medium-size oceangoing ships, and hydrofoils that cross the Adriatic to Croatia). It has 84 rooms, some with Jacuzzis and/or canal views. You won't need to cross any bridges to reach this wonderfully-situated hotel just inland from the Zattere. From the Alilaguna stop, the hotel is less than five minues away over level pavement. The Salute Palace is a bit of a walk from the Alilaguna pier at Zattere (with several small bridges to cross), but once you're there, you'll be in the heart of Dorsoduro's upscale arts district. The hotel lies on a sunny canal, and an upscale restaurant--the Bistrò da Cici--is on the premises. Venice's first "Design Hotel" is an Art Deco-inspired boutique hotel next to the Gallerie dell'Accademia. From the Zattere boat landing, you can roll your suitcase a few short, level blocks to the hotel without crossing any bridges. This long-established and popular hotel is on the waterfront, near the Alilaguna and ACTV boat piers. If you're on a tighter budget and don't mind shared bathrooms, try the two-star Pensione Seguso next door. From the Zattere, you can reach the Belle Arti without crossing any bridges: Just bear left as you leave the Alilaguna pier and head down the wide cross street (Rio Terà Antonio Foscarini). Continue a block or so to the hotel, which is on the left side of the street. This upscale bed-and-breakfast is within walking distance of the Alilaguna Blue Line airport-boat stop at Zattere, with no bridges to cross. This hotel offers great value in an upscale neighborhood near the Peggy Guggenheim Collection and the Santa Maria della Salute Church. It's a bit farther from the Zattere Alilaguna stop than the hotels listed above, but the walk is mostly level with three footbridges between the boat stop and the hotel. Don't let the Galleria's one-star category fool you: This is a decent hotel that faces the Grand Canal and the Accademia art museum. It's a straight shot down the Rio Terà Antonio Foscarini from the Alilaguna pier at Zattere. For the hotels that may be convenient if you don't mind walking a little farther, see Hotels near San Basilio on page 4 of this article.